scallop and tuna tartare with flavoured citrus foam, white miso soup poured over, and olive oil “caviar” balls that explode with cold flavour when bitten into. “In recent years, seasoned diners’ palates have become increasingly more sophisticated, wanting more than grilled porterhouses and butter-drenched lobster tails for gourmet foodie experiences. Our latest expansion may be our biggest gastronomic change ever, but is also an incredibly exciting gift to our guests that we’ve been anxiously waiting to unwrap,” explains Crystal Cruises’ Vice President of Hotel Procurement and Food and Beverage Operations, Toni Neumeister. The cornerstone of the new dining approach is augmentation of Crystal’s already top-rated galleys. New Pacojets, immersion circulators, high emulsion blenders, dehydrators, and smoke and spray guns have taken the line’s kitchens well beyond the traditional knife and stove. Crystal chefs spent months studying food science, and are now masters in such techniques as precision temperature cooking, spherification, ice filtration, and hydrocolloid stabilization, using natural additives like gellan gum to alter ingredients’ consistencies. With these tools and skills, chefs can now transform raspberries into noodle-like ribbons, lemons into sugar-like “snow”, spinach and beet root into pea-shaped balls, and lobster essence into an airy foam, without losing the flavours or textures that make the ingredients so mouth-watering. For a “modern” example, during a summertime sailing in Scandinavia, a slow-cooked “Moss-Flavoured Salmon” might be slow-cooked and use wild-grown greens and fish bought fresh from a Helsinki market that morning. The result of combining the freshest of local ingredients with new equipment and cooking processes, at least in terms of mouthful, is flavours and tastes that are more succulent than ever, no matter what side of the menu one chooses from. The tenderest of meats, the lightest of mousses, and the most flavourful of tastes are in every course, creating a celebration of contrasts, surprises, and overall gusto in each and every bite. For example, a geometric cylindrical white chocolate mousse Délice is sprayed with a red velvet powder that is actually dried and pulverized strawberries. Upon biting, a pungent centre of pureed passion fruit surprises and adds textural contrast, especially when combined with the surrounding coconut macaroon crumble and layered churros-like strip of “Baumkuchen” on top. The culinary redesign was led by the aforementioned Neumeister, inspired by the world’s top restaurants, like Spain’s El Bulli and the UK’s Fat Duck. He brought in the experts: former Fat Duck Executive and Research and Development chef Kyle Connaughton and Gerard Bertholon, the world’s top precision temperature cooking consultant who has, with his team at CREA, trained more than 40 Michelin three-starred chefs (Thomas Keller, Heston Blumenthal, and Daniel Boulud among them) in what many consider the most innovative cooking technique in the modern world. After more than three years of research and development, plus sourcing, purchasing, and redesigning onboard spaces, Crystal chefs then spent over a year in training, conceptualizing, and holding “menu summits” on board to create the new program. In November 2013, Crystal Serenity’s Tastes restaurant was also redesigned with an all-new look and new, global-inspired cuisine created in association with Sapphire Restaurant in Laguna Beach, California. Extraordinary, award-winning culinary experiences are a hallmark of every Crystal vacation. Crystal Symphony and Crystal Serenity’s extensive, innovative choices for gourmandizing include the ultra-luxury cruise line’s coveted cheese and wine cellars, overseen by on-board, certified cheese and wine sommeliers (Court of Master Sommeliers-certified); all-inclusive, chef-like cocktails served by certified mixologists; and gourmet dining options at every meal, whether in the Crystal Dining Room, at afternoon tea, or in specialty restaurants like Nobu Matsuhisa’s Silk Road and the Sushi Bar. “Open Dining by Reservation” adds more flexibility and options to evening dining. No less important in Crystal’s new dining adventures is the presentation of dishes. All modern fare is artfully arranged using gels, foams, crystals, innovative colours, unexpected geometric shapes, and other innovative methodology that creates an extra-sensory, epicurean experience of awe and delight. Liquids are transformed into solids. Ice cream is heat-resistant. An intricate web of chocolate seemingly defies gravity perched on top of contrasting layers of textures and flavours in a deconstructed Black Forest cake. It’s an experience one really needs to see and taste to believe. On the classic side, traditional culinary delights of an itinerary’s destinations are featured in each region. For example, guests might indulge in fresh seafood paella in Barcelona, a perfectly-executed chicken cacciatore in Italy, and a feijoada in South America. Complementing its newly enhanced galleys, Crystal has expanded its commitment to highlighting “local” experiences around the world, via food, whenever possible. The use of seasonal, farm-driven ingredients – a concept of quality and taste that is as old as time, but newly trendy again — is paramount: provision masters work with local vendors in order to obtain the highest quality fish, produce, dairy, herbs, and spices possible. Chefs are familiar with the different materials available in ports during different times of the year, and they have shaped dishes around market availability. To initially grasp the changes at their most elemental level, one need only open up a new Crystal Dining Room dinner menu—which, in fact, now offers two menus. On the left side is a “Modern” menu that always includes two appetizers, one soup, meat and fish or seafood entrées, two desserts, and a course of cheeses curated by the line’s cheese sommeliers. On the right is a more traditional, “Classic” multi-course menu featuring several appetizer, soup, salad, pasta, main course, and side choices. Both menus change daily, Vegetarian selections are indicated throughout, and one can pick-and-choose among each side to create their ultimate feast. On the back of the “Classic” menu is a more extensive selection of desserts, including the modern options and cheeses, plus additional sugar-free, frozen, and baked selections from the ships’ Executive Pastry Chefs. From the industry’s first specialty restaurants and onboard herb gardens to the only place to find Nobu Matsuhisa cuisine at sea, Crystal has always been a culinary leader who not only listens closely to its guests, but who also introduces product enhancements to them before they even ask, in a way that’s well beyond what they could have fathomed. 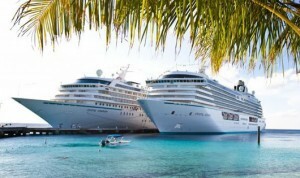 For further details on luxury Crystal voyages, please contact The Sovereign Cruise Club on 0118 911 1340.